With a 97% similarity score, we think you will enjoy saving money with the Great Value Disinfecting Spray. Neither of these items smell good, but they go on evenly and kill germs around the house. Neither of these sprays has a "Fresh Linen Scent" but they both kept our facilities clean. Brandefy compares off brands (e.g., Great Value) to name brands (e.g., Lysol) to show you when the generic is as good as the name brand, and to warn you when it is not. Our purpose is to help you save time and money, and to have a good time while doing it. We are disinfecting the facilities right now as we gear up for the height of flu season. We are big fans of disinfecting spray because it is about the easiest way to kill germs on handles and doorknobs. 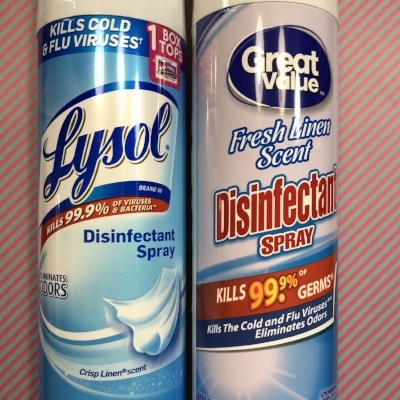 We found the packaging, and ease of spray on both the Lysol and Walmart's Great Value to be the same. They both went on evenly, and dried fairly quickly. Both products claim to have a "Fresh Linen Scent" but they both smell like chemicals. We get it, they have germs to kill. We will make the switch to Great Value, but may light some nice smelling candles once we finish the disinfecting process. Stay healthy, my friends.